In the past year or two, I've seen more patients with complaints of elbow, forward, wrist and hand pain in the clinic. Many of them have overlapping stories: more sitting, more time on their tablet/phone and in many cases - more time training aerials. Upon examination, it's become quite clear that while those areas are tight and sore, the source of their pain is actually a dysfunctional shoulder and some issues in the neck. It's true - the muscles that move the upper arm and the shoulder are often implicated in painful conditions in the elbow and hands! Often times, patients come to me with chronic pain after other physical therapy protocols/treatments have failed. When I start treating their shoulder and targeting the issues that other providers overlooked, the pain resolves - and quickly! Pain is often a liar. I'll say it again. Pain is often a liar. Often where it hurts isn't why it hurts. This is because of what medical professionals know as pain-referral patterns. Basically, referred pain is pain perceived at a location other than the site of the painful stimulus/origin. It’s the result of a network of interconnecting sensory nerves (the nerves that sense pain, pressure, temperature, etc). This network supplies many different body structures (muscle, fascia, skin, etc). When there is an injury/issue at one place in the network, the pain is interpreted in the brain as coming from "an area of nerves" rather than a specific structure. As such, the perceived area of pain may not be the source of it. Beyond that, often fascial restrictions in one area are connected to loss of motion and pain in another. Without getting into too much detail, fascia is everywhere in the body - connecting structures to one another. When it's restricted anywhere along a length - it changes how the entire fascial sling moves. To give you an example - imagine that you are wearing a pair of leggings and you put a stitch in the middle of the outside of the shin so it's stuck to your leg. When you try to bend the knee or walk - you'll feel a pull and the leggings wont' move right. Pain in the arms and hands that originates from the shoulders can also be due to trigger points (areas of tightness) in the muscles of the shoulder and neck. These areas tend to be particularly sensitive, so they are easy to palpate and find. Some of the most common muscles/areas involved in pain referral to the hands/elbows include: the latissimus dorsi, the serratus anterior, the rotator cuff muscles and the pectoral muscles. This muscle is a very common site for dysfunction and tightness. It helps you invert your body when you're on the fabrics, it allows you to slide the mouse back and forth on your desk at work, and it helps you close your car door and buckle your seat belt. Basically - it's always working! As such, it is not hard to imagine it getting tight or a trigger point (area of muscle gaurding/strain) developing in it. Because it's such a strong and large muscle, often people don't even know that it is part of the problem - until a professional points it out. This muscle helps to control the scapular motions and anchors the scapular to the thorax during body-weight support activities. When holding a push up, leaning on the arm, or hanging, it is especially active. 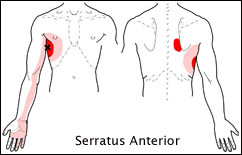 The serratus anterior originates on the ribs and attaches onto the underside of the medial side of the scapula. In many people with a history of shoulder problems, this muscle isn't working appropriately. This group of muscles is so common a problem in patients that most people personally know someone that has dealt with a rotator cuff pathology (tear, tendonitis, etc). As detailed in the blog post on the rotator cuff, it is complex group of muscles that work to stabilize the humeral head in the glenoid fossa. In many of us, the rotator cuff can become dysfunctional with a sedentary lifestyle, postural issues and poor shoulder mechanics. Often, it is the "sleeping giant" of injuries and is a contributor to many issues that seem unrelated. The pec major and pec minor lie on the front of the shoulder. The pec minor attaches to the 2nd, 3rd and 4th rib and runs to the front of the humerus. The pec major has two origins - the sternum and the clavicle, and runs laterally towards the humerus. Both assist in scapular/shoulder motion, and as many of us sit and do desk work all day, they can get tight relatively easily (due to our forward and rounded posture). If your hand and elbow pain seems to be ongoing and not improved by stretching of the hands, wrists and elbow - try doing some postural work and give your shoulders some TLC! For specific ideas - check out the flexibility blog posts and the shoulder articles already up on the site! If those don't help - consider reaching out to your favorite physical therapist for an evaluation and some recommendations tailored to your specific needs.